Cargo containers and wooden packing materials are fumigated to control the spread of pests and micro-organisms. However, fumigant gases are toxic and present a danger to human health even at low concentrations. Additionally, products shipped in containers may release VOCs from the solvents, coatings and glues used in manufacturing processes, and the concentrations of these vapors may be significant in the confined space of the container. Gas measurements are required to protect the health of any workers involved in opening these containers. As potentially hazardous gases originate from a variety of different sources, the amount of gases that need to be monitored to ensure a safe working environment, is very large. Different gases become harmful at different concentrations, so it is important to employ a method that is capable of specific measurement of each gas in the sample and able to measure a huge amount of different gases. Time consuming sampling and laboratory analysis of the air inside containers is often not feasible as the containers need to move quickly and cannot be held waiting for analysis results for long. Therefore, a portable solution is much preferable to traditional laboratory analysis. 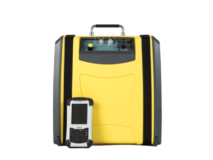 The portable Gasmet DX4040 provides a powerful and cost-effective solution to the challenge of measuring gases inside cargo containers. The use of FTIR technology enables the measurement of an unparalleled amount of different gases, which leads to improved safety of workers. The possibility to measure 50 components simultaneously means that the sample can be screened for the most important gases of interest and if something unexpected is found FTIR is the ideal tool for identifying what it is. The DX4040 is also durable, offers quick results, requires no calibration gases (other than N2 for zero measurement) and requires no consumables for sampling. This means that the cost of ownership for this solution is also exceptionally low.